Welcome Splendid Samplers! I am happy to share the block that I designed for Pat Sloan and Jane Davidson’s book, The Splendid Sampler 2. My block was chosen as one of the twenty that are being released one per week to kick off the sewalong. Once the book comes out, you will have access to all of the 100 block patterns. 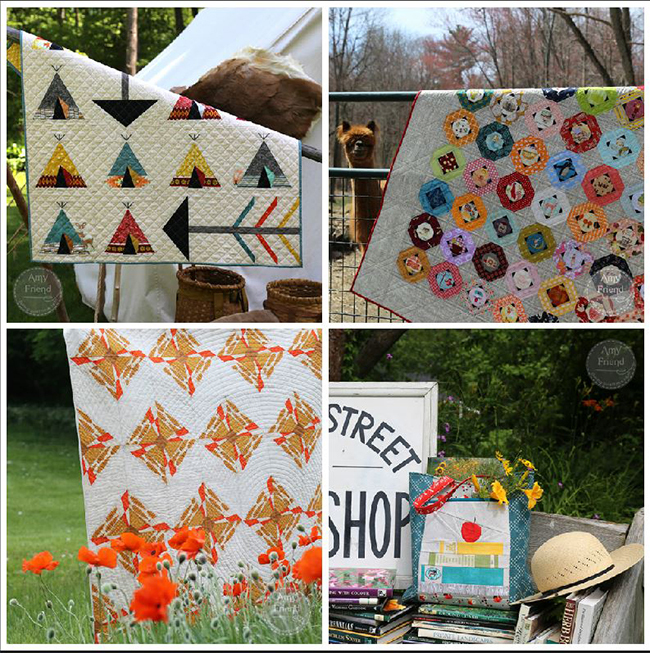 You can join the Splendid Sampler Facebook Page or follow their blog to learn all about it. I am sewing along and here are a collection of my blocks so far. As you can, see, I am using my solid stash to make the blocks. I am keeping to one color per block but using a gradient. I enjoy the modern aesthetic and I thought that this would be a good way to express it. I am not sure how I will put all the blocks together yet but I will decide that as my collection grows! I sort of like not knowing yet. I will play with them on my design wall as time goes on. 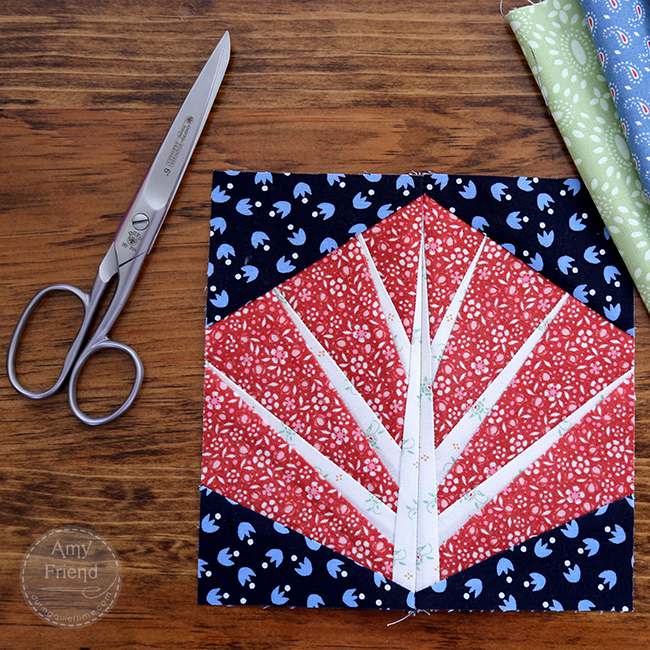 I hope you love paper piecing, like I do, because my Flowering Tree block for this week is paper pieced! It might help to read my paper piecing tips here before starting! This is my original block, sewn in the fabric collection used for the book. My new block, done in shades of green, is shown at the top of the post. You can download the block pattern for free on the Splendid Sampler web site. I hope you enjoy it! Be sure to link up and share your block in the Facebook page too so I can compliment you on your work! 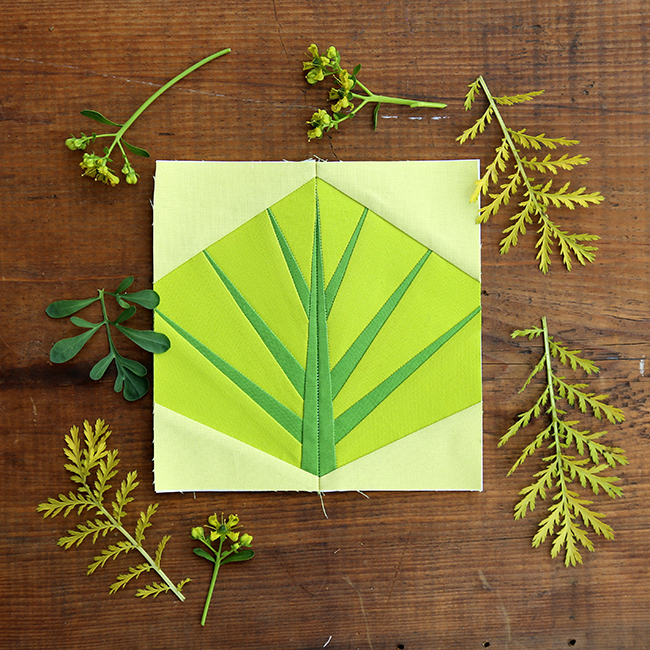 As I mentioned, I love all things paper pieced. 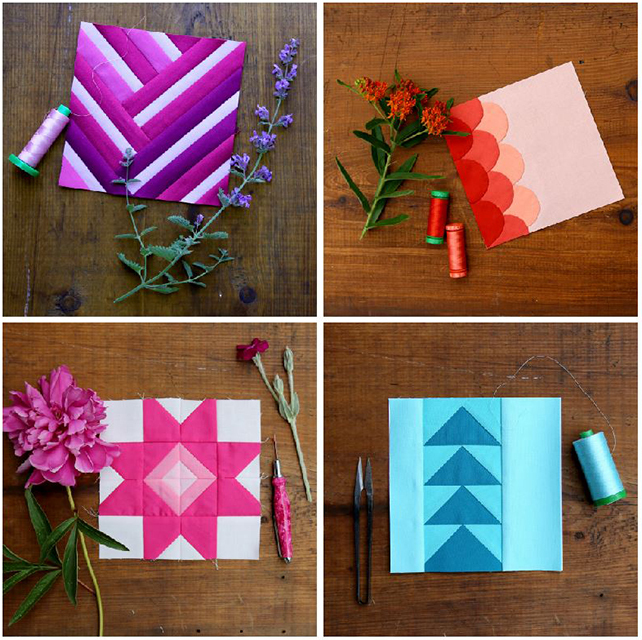 You will find loads of paper pieced patterns in my pattern shop (see links at the top of the sidebar to my pattern shop, Etsy and Craftsy). I have some non-paper pieced patterns too but paper pieced pattern design is really my specialty and what I love the most! 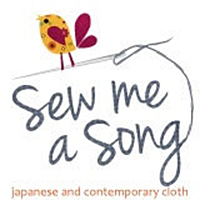 I have written two books (both heavy on the paper piecing). Today, I’d like to offer you the chance to win a copy of one of them! My first book is Intentional Piecing. It’s all about fussy cutting–using directional prints, isolated motifs, stripes, etc. I designed each project with a different type of fabric in mind and suggested how to use them in each pattern and why. 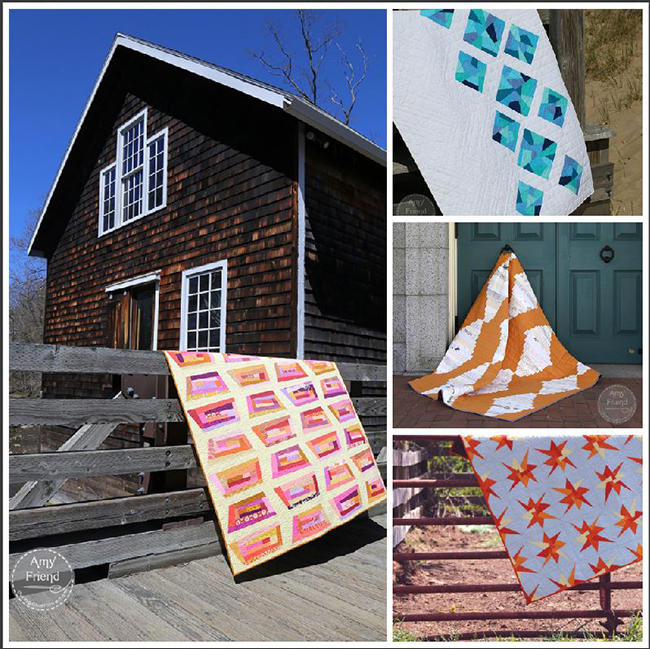 It includes several quilt patterns, along with a few bags, and 10 paper pieced pictorial blocks. The image above shows a sampling of the projects that you will find between its covers. 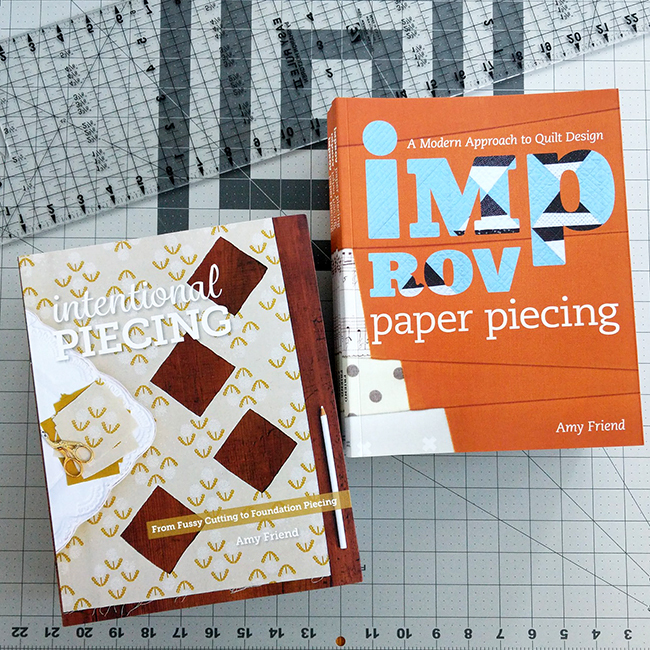 My most recent book is called Improv Paper Piecing, named after a design technique that I came up with whereby you learn to design your own paper pieced foundation improvisationally and then create a modern quilt layout. I particularly enjoy teaching this workshop! 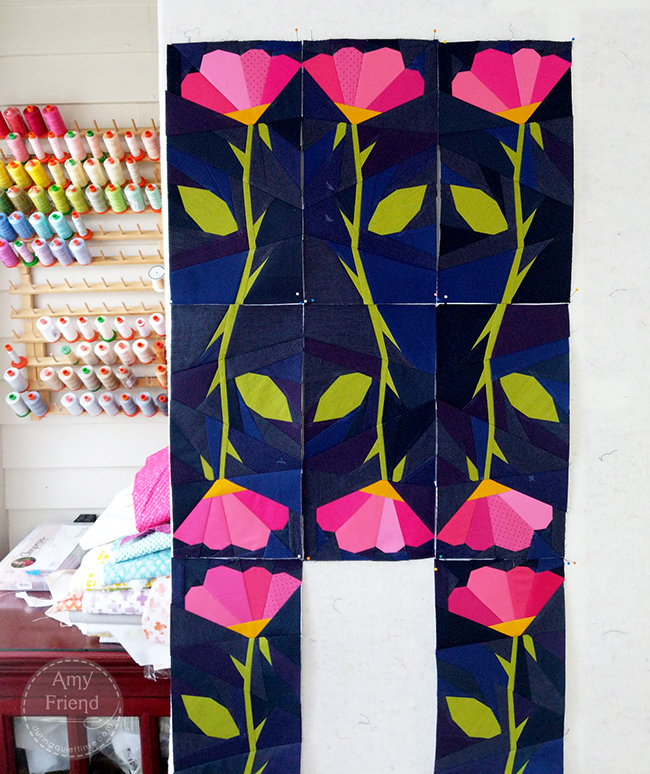 The book includes 10 quilt patterns but also teaches you how to design on your own! The pictures above are three of the patterns from the book. I am going to leave this giveaway open for the rest of the week, until the next Splendid Sampler block is introduced on August 16th. In order to enter, just leave a comment on this post telling me which book you’d like if you win–Intentional Piecing or Improv Paper Piecing. It might be yours! Thank you for visiting my web site today. Here’s a sneak peek at my current WIP. I am calling it the Juliet Quilt. I was hoping for a midnight garden kind of feel. I think I achieved that! The quilt top is now done. You can see if if you visit me on Instagram. I will share the finished quilt here just as soon as it is ready. Don’t forget to leave a comment to enter the giveaway!